The World VR Annual Summit being held last week in Crans-Montana, Switzerland goes way back to the friendship between Clayton Doherty, WVRF President, and Didier Boutroux, Le Régent College Head Master. Visionary, Didier Boutroux convinced his friend to organize its annual summits in Crans-Montana. After visiting the school and embracing its ethos, Clayton did not hesitate for one minute. Indeed, Le Régent College is committed to providing a world-class digital environment for its students and the use of emerging technologies forms a big part of how its teaching and learning evolves. To produce well-rounded, internationally-minded learners that are equipped for success in the 21st-century digital society, the school plans to use emerging technologies such as Virtual Reality, Augmented Reality and Mixed Reality in the classroom. Its partnership with the WVRF is thus instrumental. 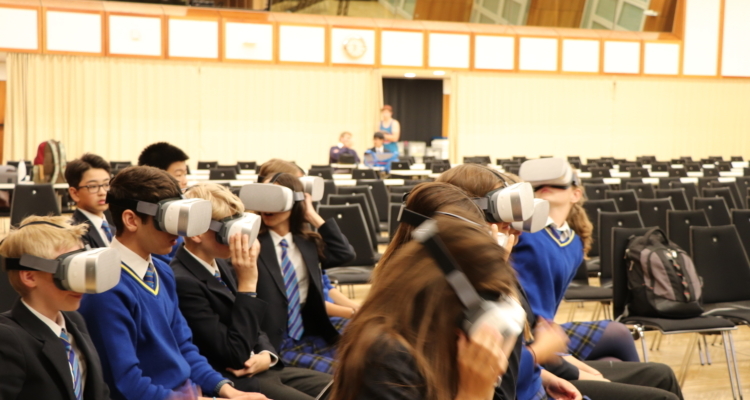 This week, Le Régent College’s students have been taking part in a number of Virtual Learning experiences that challenge what we can learn and how we can learn with the use of Virtual Reality. “Virtual Reality is not about video games anymore, it’s about social change,” stated forcefully Clayton Doherty at the World Summit on the Information Society Forum held last year in Geneva. Alongside this opportunity for Year 9, the School set up a virtual classroom in the Senior School, which was made available for students to use throughout this week. Throughout the weekend, our boarding students attended the last day of the Summit and had a blast!